WHAT IS IT? The Model VA is the newest belt alignment control specifically designed for use with bucket elevators. The unit is typically used in pairs to provide protection to both sides of the elevator leg, and indicates when the vertical belt strays or drifts beyond acceptable limits. After such time, the unit will trip an output to indicate a problem, or can be used to shut down the leg until inspection and correction is provided. WHY IS IT NECESSARY? The Model VA is one of the most economical and reliable methods for meeting the OSHA requirements under the Code of Federal regulations 1910.272 for Grain Handling Facility Standards. Typical cardboard shipping carton measures 11" x 9" x 8" each. 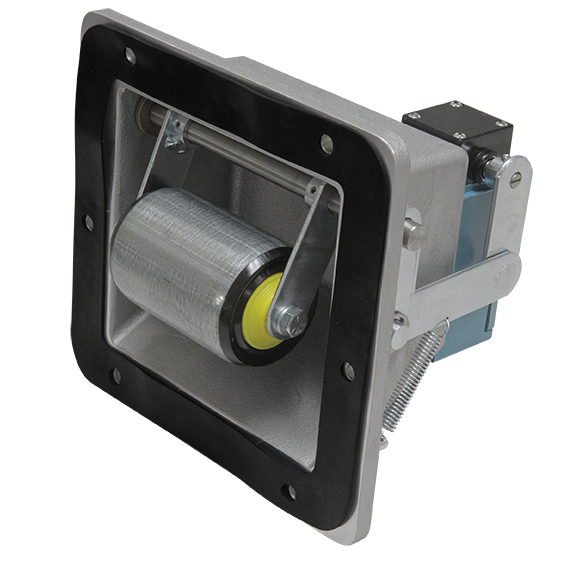 The housing is durable cast aluminum. Optioanl black epoxy powder coating or grey polyester powder coating available. Rugged oversize (2-1/2" diameter) roller with S.S. ball bearings for smooth response. The unit is mounted on the bucket elevator by drilling (6) 1/4" diameter holes and a small cut-out. Typically used in pairs to provide protection to both sides of the elevator leg. General purpose (weatherproof) units and explosion proof units have (1) 3/4" NPT conduit opening. The units have a dry, unpowered microswitch rated for 10A @ 120 VAC, 240 VAC, and 480 VAC. The operating temperature range is 14ºF (-10ºC) to 179ºF (82ºC). The general-purpose microswitch is rated NEMA Type 4/5 weatherproof and dust-tight, and the explosionproof microswitch is rated NEMA Type 7/9 for dust ignitionproof and vapor explosion proof.